The XPR-9S two-post lift offers automotive service professionals unparalleled lifting performance and lasting quality. State-of-the-art technology, top-notch materials, a forward-looking design and a 4,082-kg. lifting capacity make this lift a fantastic purchase. The XPR-9S two-post lift is designed for pros and hobbyists alike. Powerful and secure, this lift is CE Certified and meets or exceeds the standards prescribed by European Standard EN 1493. It features an incredibly rapid lifting speed and robust menu of features to increase efficiency and productivity, all with fewer serviceable parts and reduced maintenance. The results are lower operating expenses and higher productivity. If you’re looking to do more in less time than ever before, this model is the perfect addition to your shop. These two-post lift models have the capacity to effortlessly lift full-size pickups and commercial vehicles, yet they still provide specific capabilities for sport and compact cars, both foreign and domestic. The XPR-9S is a rugged, open-top model with a 9,000-lb. maximum capacity, making it perfect for garages with low ceilings. When it comes to ease-of-use, our dual-synchro equalization system and user-friendly controls are the stuff of legend. BendPak is committed to manufacturing the highest quality ​lifts on the market, which is why our engineers ensure that our ​lifts are designed, built and tested above OSHA/ALI/ETL standards. The crucial features you see on the XPR-9S are also seen in our heavy-duty truck ​lift models. The XPR-9S two-post ​lift utilizes our double-telescoping screw pads. These pads are resistant to tearing and gouging. Their thick, rugged construction ensures safe operation when used in your workplace. 63 mm stackable adapters are included as a standard set to accompany each lift, helping reach the lifting points on any vehicle. From race cars to lowered compact vehicles, this ​lift has the versatility to get under your chassis without damaging your vehicle’s body or frame. Multi-stage arms are versatile enough to handle whatever you need lifted. The arm sweep and minimum arm reach on this ​lift are extended, so the arms can lift vehicles with unibody construction. They precisely touch OEM-recommended lift points, accommodating wide and narrow wheelbases. Our tube arms have be reconfigured to make it easier to open doors when vehicle lift points are engaged by the ​lift. This is especially useful if your vehicle has low-hanging doors. We take every measure to prevent damage to your property with our two-post ​lift design. The XPR-9S two-post ​lift features an automatic engage/disengage arm restrain feature that engages when the ​lift is raised and disengages when it lowers. When lowered, the ​lift arms are easy to position under your vehicle chassis. Lift carriages are the lifting assemblies that the arms attach to. At ​1,346 mm, BendPak ​lift carriages are taller than most of our competitors’ carriages, which enables us to reduce column and load bearing stress. BendPak uses UHMW (ultra-high molecular weight polyethylene) load bearings because they are resistant to chemicals, weather, wear, etc. and will never need to be replaced as long as you own your ​lift. Other companies use roller bearings that require lubrication. UHMW load bearings never need to be lubricated or maintained. A single column structure reduces fatigue when heavy loads are applied. They are also stronger than multi-piece column designs. The XPR-9S utilizes “dead man” style controls. Unlike what the name seems to suggest, this control style features a single point safety release and makes ​lift operation safer. Two-post ​lift operators are provided with a dual-synchro equalization system to maintain level lifting and create a safe operating environment. A single-piece, pilot-fitted machined steel piston is built into every XPR-9S two-post ​lift. The piston is built into every hydraulic cylinder and includes pressure-loaded U-cup piston seal, backups and wear bands that prevent fluid from leaking over the piston. The chrome piston rod itself is micro-smooth and machined from high-yield C-1045/50 micro-alloy steel that is ground and expertly polished to a diametric minimum of .001". This supports a longer cylinder lifespan. 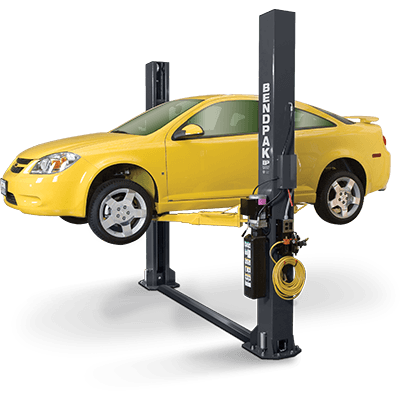 In fact, BendPak designs its car ​lifts with high-durometer and mechanically loaded rod seals, so the rods never leak. Urethane rod wipers are resistant to abrasion and offer total exclusion protection. The welded cylinder is constructed from strong steel tubing that easily exceeds ASTM specifications for certification. By offering a solid base in addition to high-quality processing, BendPak ensures that your two-post ​lift will be straight, smooth and durable for many years to come. Our hydraulic lines are 3/8" thick, and the high-pressure flow pump comes with a built-on AC power unit that allows operators to manage the car ​lift's rise and descent speeds. 220 VAC / 60 Hz. 1Ph. Note: Not all BendPak hoist models meet the standards as prescribed by ANSI/ALI ALCTV-2017 or ANSI/UL 201. Consult www.autolift.org for a complete list or contact BendPak via contact@bendpak.com.